2012 is a once-in-a-lifetime opportunity for K-12 students to experience civics, government and leadership! 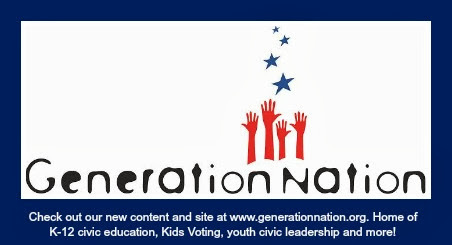 GenerationNation’s k12in2012 website - www.generationnation.org/k12in2012 - connects K-12 students with Election 2012 and civics in action through smart, fun and engaging educational resources and activities. As Charlotte’s K-12 civic education champion for the last 20 years, GenerationNation (formerly known as Kids Voting Mecklenburg) is a nonprofit (501c3) organization that educates and engages K-12 students to succeed and lead in their schools, communities and nation. Through a combination of classroom activities and experiential learning opportunities, GenerationNation educates students about government, civic participation and leadership. Programs help students in school, build their civic literacy and develop young people as effective citizens and leaders. Current programs include K-12 civic education, Youth Civics, Youth Voice Leadership Alliance, Kids Voting, #k12in2012, and other initiatives.